-We’re thrilled to launch a new data point: follower tracking! -With that info, you can put together a very specific idea of what your typical listener is like. -Helps you refine your content with a target audience in mind, as that target will dictate the angle, language, and overall tone you’ll take on when approaching your podcast. -Statistics can let you know if your show and target line up and help you hone your show segments/topics further. -If you’re looking to actually earn money through your podcast, then detailed statistics will provide the crucial data you need to report to ad agencies or sponsors. -They’ll know exactly what types of products or messages to advertise during your podcast and the kind of reach to expect. -What can your followers tell you? -For one, you can trace spikes in followers back to actual episodes and marketing decisions. -Maybe that spike coincides with that amazing interview. Or perhaps it came right after that killer social media campaign. -Second, one could argue that your follower count is just as, if not more, important than your plays. -However – similarly to subscribing – someone who opts to follow you and your shows is committed. They want to find out more and plan on coming back. -It also shows you’ve kept up all your promises on your end as a phenomenal podcaster: keeping up with high-quality content, a consistent schedule, and engaging material. -Lastly, follower info helps you get to know your audience well – like really well. A Spreaker follower is an actual person with a profile you can look at. -So, whenever you see a sudden upshot in numbers, find out who else that follower follows and who follows them back, and discover a whole network of communities to tap into. -These new statistical gold nuggets can be found straight from Spreaker’s CMS, right in the Statistics section, though only if you have a Broadcaster plan or higher. -You’ll see your total amount of account followers on any given day and track their growth as time goes by. -Like what you see? Take a peep in your CMS to see the new development! -Want to add follower tracking to your dashboard? Upgrade now to the Broadcaster plan! -Basic tips to help you make your podcast one that is advertising and sponsorship ready. -Know your audience. Do the best you can to know your audience size along with some general demographic information. -Publish on a consistent schedule. Shows that have a track record of keeping a regular schedule are more attractive to advertisers. A consistent schedule tells the potential sponsor that you are very likely to deliver your audience. -Show branding like a header image and/or show photos. -Description of your show and content. -Podcast producers and hosts bios. -Statistics: Number of episodes, publishing schedule and estimated/actual audience size per episode download number over a 4 week period. 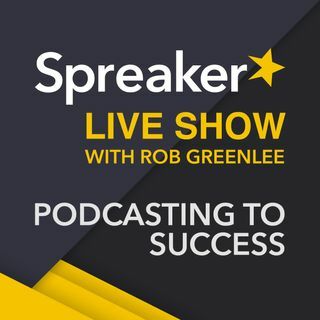 -Basic demographic information on the audience including ages and geographic locations that you can get with a Spreaker Pro account. -Quotes from reviews or press related to the podcast. -Information about the types of advertising you are seeking and host read locations in podcast. -Contact information including the name and phone number of the appropriate person. -Prepare your audience for advertising. Feel free to let your audience know that you are seeking sponsorship. Someone in the audience may want to sponsor you! Get feedback on the types of advertising they might like to have in your podcast. I recall some people when previously discussed wanted certain shows to have their numbers showing and some not. Do you think we should turn our public episode numbers back on? I don't think I'll ever succeed on Patreon. I think just asking for a donation would be better. :joy: Alex can really get into it. I understand just what he mean about Facebook. I often wondered why I wasn't getting hits or not seen on Facebook and Twitter. Sometimes I'm at zero hits but have views. I never understood, but listen to you and Alex help me to see. It might be a good idea if Alex interview Facebook!!! On another note... Do you have recommendations on how to classify a show with more than one topic focus? For example, books doesn't 100% fit for my podcast neither does television. I'm 50/50 with book content and TV/movie content. I did a Spreaker ad and got zero results. Unfortunately, the Spreaker ads (at least when I did it months ago), can not share an estimated reach or listens. It's unlikely I'll spend more money on Spreaker ad until it becomes a bit more sophisticated. Very true, certain topics and language can turn off advertisers. No, just give you some talking points to make sure you cover. When you get ads, don't they try to dictate or begin to shape the way the show develops? The same thing is happening with Instagram...limiting what users see, obviously, if you pay for Instagram advertising then you'll get more exposure. I usually only post once or twice a day at most on Facebook. Question - when opening a Spreaker account with a Twitter account, does Spreaker auto "follow" those that you are already following on Twitter, inside Spreaker? Facebook . . . my pages stats went up this week everywhere except where we have 1,000 followers. That page went down. ??????? The majority of my listens come from my RSS feed on my web site, then through Facebook, then through Twitter and Sound Cloud. I do advance notification to social media via Word Press blog.